During the Soviet occupation, we were distributing anti-Soviet and anti-puppets leaflets, staging demonstrations and strikes in schools and universities, instigating the women to contribute in resistance war in any possible way despite the opposition from the fundamentalists, running schools, a hospital etc. for refugees, publishing and distributing "Payam-e-Zan" (Women's Message) and so on. It was in the course of such activities that a number of our activists were arrested in Kabul underwent horribly tortures and some of them languished about 8 years in the notorious prisons, and our founding leader Meena and her two aides were murdered at the hands of the KHAD agents and their fundamentalist accomplices in 1987. After the fall of the puppet government and the invasion of the fundamentalists bands into Kabul, RAWA focused more and more on women's rights, human rights and exposition of the fundamentalists barbaric actions. Due to RAWA's principled anti-fundamentalist stand, our social work amongst refugee Afghan women is an uphill struggle. Despite numerous difficulties we have regular contact with women in different camps of Pakistan. We happily note that the fundamentalists' endeavors in this regard have been vastly counter-productive as a great number of women from refugee camps in Quetta and Peshawar approach us for comfort, aid and support. However, the aid and support we can give them are mostly moral, as facing grave financial problems, little material help can be provided to them. Notwithstanding, we are very much encouraged by the reactions we receive from refugee women. In order to better assist refugee women and children, we try to the best of our ability to attract the support of aid organizations to our health and educational setups. But unfortunately due to the lack of aid most of our projects have not been implemented. Education: To run 15 primary and secondary schools for refugee girls and boys and many literacy courses for women. To provide teachers and material for some schools for refugee children especially girls' schools run not by the fundamentalists. RAWA is also running 9 orphanages in Peshawar, Islamabad, Rawalpindi and Quetta comprising girls and boys. Human rights: We are providing human rights and other interested organizations and media with news and reports about killing, stoning, amputation, imprisoning, torturing, beating, lashing, insulting and other inhuman acts of the fundamentalists. We also try to put all or at least important parts of the news and reports on our web site in addition of printing parts of them in our publications. Cultural: Producing cassettes of songs usually with anti-fundamentalist contents and those containing educative subjects. Staging dramas and skits; holding "Nights of poetry" and "Nights of story"; publishing posters, brochures, booklets, "Payam-e-Zan" (both online and printed editions) in Pashtu, Persian and Urdu and the non-periodical "The Burst of The 'Islamic Government' Bubble in Afghanistan" in English. Propaganda and political/social: To organize demonstrations or functions on February 4, March 8, April 28, December 10 and December 27, in addition of some unexpected major events which may require an impressive action from women. To hold press conferences, to issue press releases and distribute statements and leaflets, to keep the web site updated and enriched with photos and reports from Afghanistan, facts and informative write-ups. To participate at the events of Pakistani political parties or women's rights groups in order to expose the fundamentalists' crimes and raise awareness of the people here about the situation in Afghanistan. To give interviews with many print and electronic media, to take some journalists inside the country and refugee camps in Pakistan, contact with other Afghan and foreign organizations etc. We also have many different social circles in which the participated women and girls are being thought about the concepts of women's rights, the nature of the fundamentalists, objectives of our Association, conditions of the women under the fundamentalists, the need for struggle against the religious bigots and for the human rights, ways and means for the speedy solution of the Afghan problem and involvement in the social and political life of the country. We are also assisting the widows and the families of the prisoners. We contact those who have member of their families imprisoned by the Taliban or Jehadis inside Afghanistan or caught by the Pakistani police and put in the jails of this country. We help them by contacting the police and in some cases providing them judicial and legal help. We are also helping those women who are being tortured or maltreated by their husbands or in-laws. If the tortured/abused women wanted shelter, we try to help them in any possible way. Financial: Running handicrafts, carpet, tailoring and bead knitting workplaces; running chicken and fish farms; producing jams and pickles and making chalk etc. Our work inside Afghanistan consists mainly of support to female victims of war and atrocities committed by belligerent groups. Our workers contact families and particularly women who either themselves or their family members have been victimized by the fundamentalists. Highlighting their misadventures via reports published in Women's Message, alerting international sentinels of human rights such as Amnesty International and similar organizations to human rights violations against women, providing psycho-social support, transferring victims to Pakistan for medical treatment, transferring children of traumatized families to Pakistan for rehabilitation and a better chance of education, tracing missing females and/or their family members, assisting families in evacuating from battlefield and areas affected by any natural calamities and resettling them in safer places, supplying such families with basic living needs and in extreme cases identifying sponsors for 'family adoption' of uprooted families or individuals and facilitating their integration. We also distribute food among needy families in drought/war/earthquake-stricken villages. 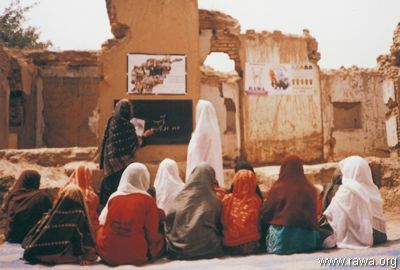 Educational/propaganda: Though our activities inside Afghanistan are underground and restricted due to the prejudiced and brutal behavior of the fundamentalists, we are successfully running our "home-based" schools and literacy courses. For the time being we are running schools for girls and boys and literacy courses for illiterate women and young girls. Our work under the fundamentalists is difficult and dangerous. We also have circles of women and young girls in which we discuss with them about concepts such as women rights, the need to fight the fundamentalists, the necessity of education and social participation, concepts of democracy and civic freedoms and the ways to solve the Afghan problem and maintaining women's and human rights in Afghanistan. Health-care: We have mobile health teams in 8 provinces of Afghanistan. The mobile teams mainly treat those women who cannot go to the doctors because of their financial problems. We also treat the children and in some cases the wounded men. In the areas where they work, our mobile teams are usually delivering about 3-child per day. In addition of treating the women and children, our teams are also running first aide courses for young girls and literate women. Last year the teams successfully carried out the polio vaccination program in their concerned areas. Financial: We have chicken farms, small carpet-weaving, embroidery and knitting workplaces, bee- fostering project, handicraft and tailoring units. All these projects are under the direct control and supervision of RAWA. Moreover, we also provide assistance to those women who want to run their own projects like chicken-farms, handicraft or tailoring. By providing them short-term loans we help lots of these women, who are mostly widows, to feed their families. 1- To expand and focus for activities as much as possible on education of women and children; establishing free and modern schools, institutions and courses; publishing text books and audio and video tapes containing today's knowledge and sciences and distributing them freely among the pupils; establishing libraries not only in the cities but in the rural and remote areas. We have these plans because we are firmly of the opinion that knowledge itself is a great power and it will raise women's awareness about their human rights and their place in society and about the social and political problems of the country which consequently will lead to understand their worthy role in every sphere. 2- To set up many computer courses for women and girls with the Internet facilities. We have learned how wonderful is having access to a computer and Internet. It is by itself a "university". We have a keen desire to educate as many women in computer as our possibilities might permit. We will do our best that computer and Internet must not be seemed as monopoly of men. 3- In addition of including English in curriculum of all our schools and even courses, we have plan to establish English courses for all women and girls. It would make our plan to promoting computer education, rather complete. Without having access to computer and familiarity with English language, enjoying a civilized life in 21st century would be difficult if not impossible. 4- To establish numerous courses for women especially for widows in order to learn them a trade so that they can earn their living as honorable members of society. 5- To publish special books and periodicals for women, teenager girls, adults, youths and children in the main languages of the country. 6- To establish "Meena Library" in every main city of Afghanistan and provide thousands of modern books in Persian and Pushto to public. 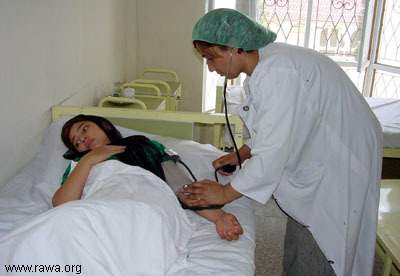 Despite extremely limited resources, RAWA strives to provide free health services to women in Afghanistan and Pakistan. 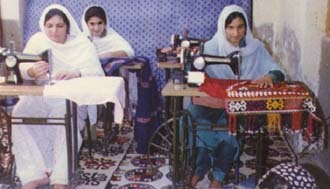 What RAWA can provide is only a drop in the sea as compared to even the basic needs of our suffering women. To serve thousands of our female refugees and their children, RAWA founded Malalai Hospital in 1986 with a number of sections and 25 beds. Financial constraints, however, brought this hospital to the point of closure in 1996. But we re-opened the hospital in Nov.2001 in Pakistan which was later shifted to Khewa, a refugee camp in Peshawar, but with the closure of the camp by Pakistan authorities and lack of required funds we had to scale-down it into a clinic and shifted it to a remote village in Afghanistan where most of the families from Khewa camp were re settled. Afghanistan has one of the world's worst literacy rates, estimated by UNICEF at between three to four percent for females and 28 percent for males. The fundamentalists are the champions of illiteracy and highest incarnations of ignorant arrogance. RAWA believes that despite manifold impediments and meager resources, one of its duties is to carry the torch of literacy and knowledge among women in defiance of the fanatics and enlightenment-hating fundamentalists. Since 1987, RAWA has established a number of schools for the refugee children to impart basic knowledge and modern thoughts that the fundamentalists deny them. Though these schools were closed due to lack of funds in 1996, but we happy to say that by the donations received from supporters around the world RAWA opened around 15 schools only in Pakistan that are running now. We also have hundreds of literacy courses for Afghan girls and women in 12 provinces of Afghanistan and in refugee camps in Pakistan. The number of women who have lost their male breadwinners to the fundamentalists’ criminal infighting can be counted in the hundreds of thousands. They eke out an existence in conditions of increasingly inhuman Taliban restrictions. Unfortunately due to extremely meagre resources RAWA can provide income generation support to only a very few. As a feminist organization struggling for freedom, democracy and women's rights with a clear anti-fundamentalist stand, RAWA has been deprived of support from governments, UN or NGOs working for Afghanistan. We are mainly relied on individual donations that we receive from our supporters around the world. The membership fee of our members and supporters in and outside Afghanistan is another source of our finances. We also generate some from the sale of carpets and other traditional handicrafts products of our workplaces. Our publications, cassettes and posters also contribute to our thin resources however we are finding it difficult to match with our ever increasing needs. That is why we have not been able to publish our journal regularly. Other activities of RAWA, such as holding seminars and conferences, staging demonstrations and undertaking lobbying for our rights have been severely hampered. We feel that the intensity and impact of Afghan women’s activism for the cause of democracy, and against fundamentalism, would have been much wider and more tangible if we were not in financial dire straits.